Nagtitipid para sa school fees. Nagtitipid para pambayad ng renta. Nagtitipid para may pambili ng ticket sa Pilipinas. Nagtitipid para umabot ang budget hanggang payday. Can you relate? Do you also scrimp to save? Will you accept my advice na huwag magtipid? Ahh, I can now hear the violent uproar of the majority!!! Their money blocks are now in a full-blown rage because of the blog title. Were you triggered? Do you want to write a comment or send me a PM that I’m absolutely freakin’ wrong? Ok, let me clarify my statement. I want you to save. In fact, I want you to know that how much you save is more important than how much you earn. Ohhh… I can sense the tension now and I’m excited. You know why? Because that means I have your attention. And this attention might lead you to read the full post (I hope so) and see where I’m coming from. Scrimping (pagtitipid) is so ingrained in our subconscious to live a wealthy life. We have heard it so many times even from those so-called wealth coaches. I’m not challenging these pieces of advice. These might all work for some of you. You know, scrimping is easy. Huwag ka lang lumabas then walang gastos. Just deprive yourself of most ‘luxuries’ then you can save money. Even if you want salmon for lunch, you can opt for sardines because you’re saving. It’s totally different when you find it exciting to save. Mas bet mo mag ukay ukay because of the challenge finding good vintage pieces for a fraction of their cost or you feel healthier eating vegetables. You might be scrimping because of your values and what you believe in. That’s cool. Go ahead. To each his own. Our default action when we want to save is scrimp. Because scrimping is way easier than being courageous enough to step out of our comfort zone. Will you be happy if you can achieve this? WIll it bring a smile to your loved one’s faces? If yes, go to step 3. If not, think of another goal that will answer the 2nd question. Imagine the joy that the experience will give you and the people around you. The happy faces, the excitement, the contentment, and feeling proud that you finally have experienced it. Now, this is the exciting part and will determine how strong-willed you are – what will you do to achieve your goal? You can be as imaginative as you want but one thing is not allowed, don’t take the money out from your monthly budget or savings. You have to think of ways to generate extra income (tips: sell your unwanted stuff, bake cookies and sell to officemates, take some online VA tasks). 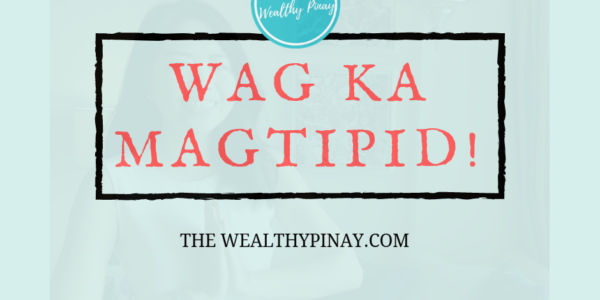 One of The Wealthy Pinay’s goal is to challenge your old money beliefs that don’t serve you. I want you to open your mind to all possibilities and give an alternate way of thinking. As an intelligent human being, you can decide to throw the idea out of the window, or understand where it’s coming from and see if it fits your values. In 2015, you can say that I’m awakened. I challenged my own way of thinking. I pushed myself to do things that I never thought I’m capable of. Being an introvert, I forced myself to be more outspoken and open up. To say that I pushed my limit is an understatement. I pushed, stretched, expand, extend, bend, unbend. And this simple question will always force me to think out of the box. Most of the time I don’t want to step out of my comfort zone. Why would I? Inside my comfort zone, I feel safe, warm, feel good, no threat or worry. I can stay here forever and be fine. But whether we like or not, our surrounding changes. People we deal with change. We changed. Are we equipped to deal with these changes? Should we just react and be on defensive mode when things go unplanned? Or should we prepare for it now while we are young and abled? We always have a choice. And I hope your life choices will lead you the life you have imagined for yourself. You deserve that life. Yes, you definitely do. P.S. Do you agree with me? Can you add anything from this topic? Share your thoughts and voice it out.